Construction equipment major JCB has made an announcement of investing Rs 650 crore for its sixth plant in the country. This new plant will be located in Vadodara, Gujarat, and will be responsible for manufacturing parts for the company's global production lines. 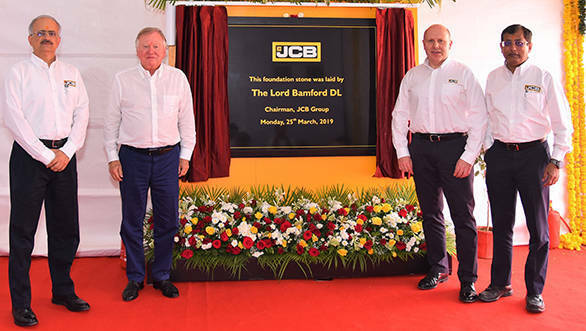 The foundation stone for the new plant was laid by JCB Chairman Lord Bamford. The company mentions that India has been JCB's biggest single market since 2007. Also, the latest announcement is a part of work on a £50 million factory to build cabs for JCB machines in Uttoxeter, Staffordshire, UK which will be completed later this year. "This new factory will be manufacturing engineered components and sub-assemblies for JCB's many factories around the globe. It will add to the capacity at our existing plants in India. Vadodara presents us with the advantage of being located close to the Surat port and also to our key suppliers," commented Vipin Sondhi, MD and CEO, JCB India. JCB India already has factories in Delhi, Pune and Jaipur. Production at the new facility in Halol-II, Vadodara on a 44 acre site, will begin next year. It will house the most modern laser cutting, welding and machining technology and will be a fork-lift free operation. It will be capable of processing 85,000 tonnes of steel annually. "With major investment in manufacturing capacity in the UK and India, we are very well placed to grow our business in the future. This year, we celebrate 40 years of JCB India and our success over those four decades is down to our continual investment. It's fitting that we mark the 40th anniversary with an investment in a factory which will give us enormous manufacturing capacity," commented JCB Chairman, Lord Bamford.